November 19, 2018 – Divin wants to be known as someone who has shown love to humanity by his actions not simply by his words. This semester Divin is hopeful that he will perform highly in his classes with the goal of being top performer among the TNHF students! July 7, 2018 – Divin said that the biggest challenge he had this last school year was his class on financial management, but he was able to put a lot of his attention towards it and work hard which helped him to pass the class! 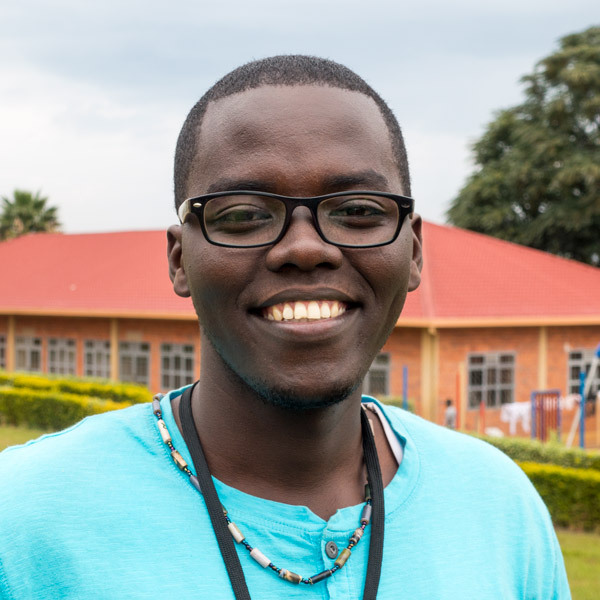 This summer, he is looking forward to doing his best and working hard at his internship with Edify Rwanda! May 12, 2018 – The two things Divin values the most are love and education, because love can help heal a lot of things in our lives and education is the key that opens doors to new opportunities! March 25, 2018 – When Divin was younger, he wanted to be a soldier because his father was a soldier and always inspired him! In five years, he hopes to be working in a business while working on his master’s degree in business administration! Feb 27, 2018 – Divin said the president of Rwanda, Paul Kagame, inspires him a lot because of his background and where he is today, he also said that his leadership style is amazing! Jan 25, 2018 – The last book Divin read was, The 7 Habits of Highly Effective People by Stephen Covey. He said he learned so many different leadership skills from the book that he can put into practice in the different areas of leadership in his life! Dec 18, 2017 – On Christmas, Divin says people buy new clothes to wear to church, and then after church they gather together to cook special foods to share with family and friends. “Kind” is the word Divin believes his friends would use to describe him because he is always trying his best to help others. Nov 11, 2017 – Divin is thankful for his health and for These Numbers Have Faces’ family! He loves how everyone goes to church on Christmas, and that it is a day of reflection . He looks forward to the new year. Oct 8,2017 – Divin enjoyed his summer working as a cashier at a hotel! He is looking forward to starting his third year at school and is hoping to work hard to receive the best grades he can. May 25, 2017 – Something Divin wishes more people knew about Burundi is that despite the recent political crisis, it’s a very beautiful country. March 27, 2017 – When asked about the 3 things he values most, Divin said the love of God, people and education! Feb 13, 2017 – The three things that make Divin feel most empowered are leadership, love and prayer. Jan 17, 2017 – Life isn’t without challenges. Last year Divin had to make the choice between a job or going to school. It wasn’t an easy decision, but he is excited to be living out his dream! Dec 28, 2016 – Divin is motivated to make 2017 the best year yet academically! Where does his motivation come from? His TNHF aunties! Dec 8, 2016 – Divin’s role models are Nelson Mandela and Rwanda’s President Paul Kagame. Their leadership qualities are traits Divin hopes to emulate as he studies leadership! Nov 20, 2016 – When asked about what he’s thankful for, Devin said the strength and hope he has found through being part of a family in These Numbers Have Faces. Oct 14, 2016 – Because of the unrest in Burundi, Divin chose to stay in Rwanda over the summer holiday and pray for his family and friends. Divin was born and raised in Burundi. He enjoyed a close relationship with his siblings. After their parents passed away, Divin and his older sister went to live in Rwanda, where Divin is now their sole provider. With a passion for business, Divin’s vision is to become an entrepreneur, helping his family rise above their circumstances and creating jobs for others in their community.